Virginia Rometty may be the new face of IBM (s IBM) when she takes the helm as CEO in January, but she is expected to keep pushing her predecessor’s vision of cloud-computing services — hard. It is these services that increasingly drive IBM’s business and its profitability. 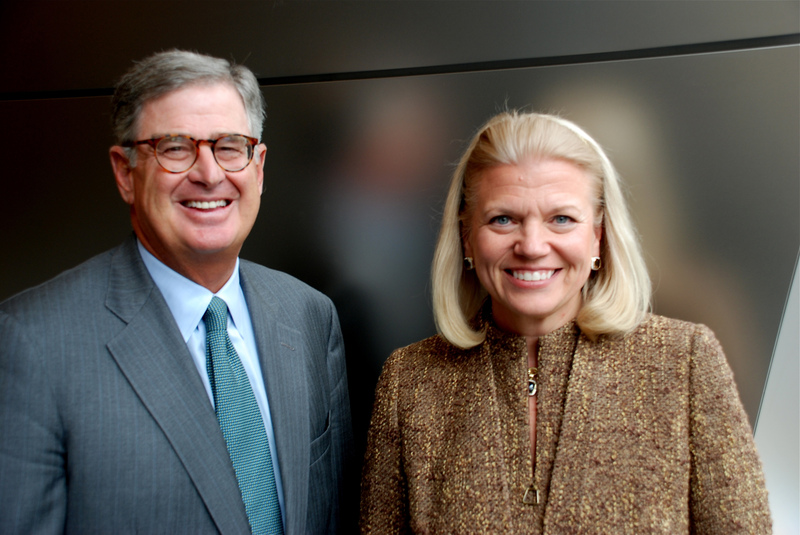 IBM’s outgoing CEO, Sam Palmisano, divested some of the thinner-margin stuff like PCs to focus more on the richer realms of software and services. Rometty worked with Palmisano on this services-fed strategy for some time, and if it’s succeeding, continuity is the best policy, said several IBM watchers. “Why should she change the strategy when she helped build the strategy and it’s working so well?” asked Bob Djurdjevic, the president of Annex Research, who has followed IBM for more than 20 years. “Cloud services have been a distinguishing characteristic of IBM for years and it’s been interesting to watch other companies poo-poo this strategy — companies like Oracle (s ORCL), like Microsoft (s MSFT), like HP (s HPQ), who have since announced their own cloud strategies,” he added. Indeed, Oracle CEO Larry Ellison used to scoff that IBM offered so much hardware and software just so customers would have to write checks to IBM services to integrate them. But once Oracle bought Sun Microsystems, he started holding up the IBM of another era as the ideal prototype of a company. Oracle unveiled its cloud computing earlier this month at its OpenWorld conference. Judith Hurwitz, the president of Hurwitz and Associates, concurred that Rometty will stay the course. Rometty has been transitioning to this role for some time, Hurwitz said. In 2002, Rometty helped engineer IBM’s $3.5 billion buyout of PricewaterhouseCoopers‘ consulting business before going on to lead IBM’s global sales effort. IBM now derives a big chunk of its revenue from both professional services (via IBM Global Business Services) and infrastructure/outsourcing services (IBM Technology Services). In its most recent quarter, IBM logged $10.3 billion from Global Technology, up 9 percent from the year-ago period, not figuring in currency changes. Global Business Services were up 6 percent, to $4.8 billion. IBM also said its cloud revenue for the first three quarters of this year was double its cloud revenue for the full previous year. Rometty started at IBM in 1981 as a systems engineer, so she’s done her time in the tech trenches as well. She is known to be a very good communicator — both one-on-one and before large audiences. “I give Palmisano credit. He picked someone who is more charismatic than he is. In fact, more charismatic than any tech CEO I’ve seen,” said Djurdjevic. I wonder if she will continue the same cynical policies of laying off 1,000’s of people as a short-term cost-saving measure, then try to hire the “same kind” in a few years when business is “up” with lures of how wonderful it is to be an IBM’er. Right – I was laid off a few years ago, and now positions like mine then are being advertised by IBM. I will never be going back to that disloyal employer who demands a ridiculous degree of loyalty from its “greatest asset – our people” (unless of course it is my last resort – might as well be as cynical as IBM). yes, Aro, IBM has downsized a ton. Not unlike it’s competitors.